Dusk had long since said goodbye, smearing a slice of peach across the mountains on the western horizon. “Just one mooooore,” you pleaded as the embers dimmed. Soft light glowed on the hairs of our shins, flickering in the summer breeze. Goosebumps popped up on my bare shoulders and I almost conceded. None of us wanted it end. “Gotta quit while you’re having fun,” I said, standing up from the old Adirondack chair and casting one last gaze at the dying fire. I leant over and kissed the crown of your head but you were entranced. I sighed and wandered into the house, leaving you lovestruck, stuck in blind passion for a flame that had already perished. In my astrologer circles, everyone is chattering away about the sky being on fire, inflamed, overzealous. With Venus back in Pisces and Mercury still in the first degrees of Taurus, we’ve been given a slight reprieve from the raging heavens. 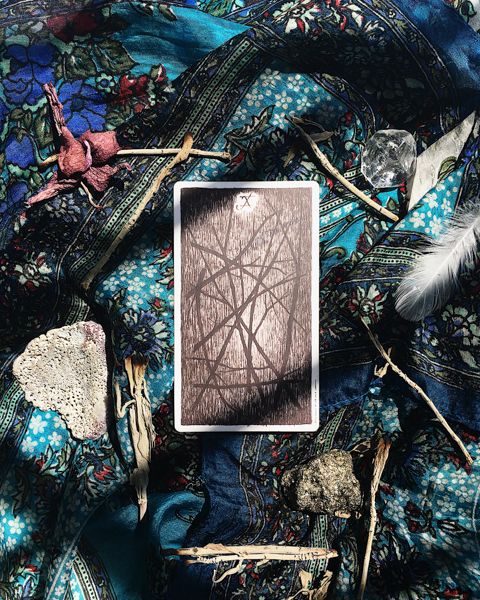 As our infernos turn to candles this week, fueled on by a full moon in Libra, the Ten of Wands asks us to consider what inspires us. Where have we lost ourselves and our purpose in the frenzy of the fight? Where did we jump in the race, only to forget we are running a marathon — and rapidly run out of speed? Let this week wash you clean of any hate or misdirected fanaticism that may have gotten a bit too messy this past month. Tens show us the culmination of each suit; what happens when we’ve fully expressed the energy of each element. In true Aries season fashion, we've been given the gift of pushing to our potential. The Ten of Wands reminds us that if we fight fire with only fire, we’re sure to burn out and leave a path of dismal destruction. This week is an opportunity to bathe in the sweet glow of quiet connection; a moment to simmer so to speak. Let the bread cool. Admire the undisturbed. Feel for the earth beneath the balls and heels of your feet. Lavish in learning how the magic of time mixed with elements air, earth, and water can provide the perfect rekindling of your eternal embers.